In an effort to bring more attention to cell phone addiction, Morningside Recovery has published an article highlighting cell phone addiction facts and symptoms. Two-thirds of the population has experienced some level of nomophobia, yet the majority of the population does not know what it is. Two-thirds of the population has experienced some level of nomophobia, yet unfortunately the majority of the population does not know what it is. Morningside Recovery has recently published an article titled Nomophobia Fact & Nomophobia Meaning which outlines the facts, symptoms, consequences, and treatment of cell phone addiction. The term "nomophobia" refers to the fear of losing a cell phone. This fear manifests itself as the constant attachment a nomophobic would feel to his or her mobile device. This attachment to the cell phone has deeper and more significant consequences. The cell phone is simply the device that represents a connection they feel. The desire to always be “connected” is an underlying catalyst for nomophobia. Although this condition was present with cell phones, smartphones have exacerbated this condition. Instead of simply checking a phone for a missed call or text message, a nomophobic will also check email, Facebook, Twitter, and whatever other daily habit they have with their smartphones. In a related article, Morningside Recovery professional Dr. Elizabeth Waterman indicates that although many individuals may suffer from mild nomophobia, it only becomes a full-blown addiction when it begins to interfere with the standard of living, social relationships, and professional obligations of the individual. If a person is able to control his or her phone usage after a friend, family member, or coworker mentions this distraction, this individual may not need to seek professional help. However, if it continues to be a problem, then it may be important for that individual to go to a professional. Since the meaning of nomophobia is not well-known, often a cell phone addiction can be overlooked. It may be chalked up to a teen just "being a teen" or a workaholic’s need to constantly be updated on business. In a school setting, a student who is constantly attending to their phone is not paying attention to their education. Their grades will begin to suffer as they become more and more distant as real interpersonal relationships are replaced by those in the digital world. Cell phones in the workplace can be a constant distraction. Although there are usually rules concerning their usage, nomophobics will constantly sneak peeks at their phone, possibly risking their professional career. 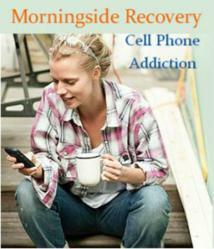 It is easy to see how a cell phone addiction can devastate an individual’s life. As with any addiction, recognizing and acknowledging the addiction is the first step. Nomophobia's lack of exposure prompted Morningside Recovery to publish information explaining nomophobia's prevalences, causes, and treatment. These are all indications of cell phone addiction and a professional should be consulted if these symptoms are present. For other Frequently Asked Questions, please visit Morningside Recovery FAQs.